To summarize a dialogue between two stuffed toy characters in a children’s book, “real” isn’t how you are made, it’s something that happens to you. Sometimes it hurts; it doesn’t happen all at once and by the time you’re “real” you’ve lost a lot of your attractive features and your parts are worn out. But that stuff doesn’t matter because once you’re “real” you aren’t ugly, except to people who don’t understand. I began this blog by warning people that it wasn’t going to be about sugar coating life, that it was going to show the real me. Perhaps after reading the story of our journey it’s more clear now that the realities we faced have stripped away masks and concerns over letting people see who we are and what we’ve been through. Sometimes people think it’s safer and more productive to only talk about good things and share positive opinions because anything negative invites more negativity and encourages dwelling on the not-so-positive aspects of life. I’ve disagreed with that for years, but never as strongly as I do now that I’ve learned the importance of people being real with each other no matter what that reveals of our inner weaknesses, sufferings, or fears. We can spend a lot of time trying to be someone we’re not and hoping that others believe it, or we can free ourselves from the game and choose to take the risk of being real. For me it’s been worth it because it has not only deepened my relationships with others, but it’s also opened the door for others to free themselves to be more real with me. We are who we are and the games we play just add layers that make our lives more complicated, and create more discomfort for us. The game wastes valuable time and we have so precious little of it to play with. Sometimes there’s a moment that marks time in a way that will forever divide your life into two parts, before it and after it. I was chatting with my daughter the other day about what life will be for us now, and we realized that we can’t just go back to our lives as they were before the accident. We don’t really relate to them much anymore and so many pieces are missing. Coming through this tragedy of the past two years has changed us all in ways that only others walking the same path can know. We’re all different people than we were before and we carry something within us now that colours our experiences and our perspectives differently. We have to find our “new” way of life and we will; we are trying. It is both a sad reality and a new beginning of sorts, for all of us to discover ourselves again now, apart from this event that locked us together in what was almost like a pause in a movie where everything stops. Now it’s as though the play button has been hit again and we are to keep moving but we’ve forgotten our parts and our lines, perhaps because they no longer matter and it’s time now for a different script. I can’t imagine how this will go, what life is going to be like as I move forward now without Pat to share it with me as was the plan – as it is with married couples who look forward with shared dreams to what will be their retirement and golden years together. It’s hard to get excited about ideas that don’t involve him anymore, but he spent many years taking care of me and working hard to provide whatever would make me happy so I know he would still want me to enjoy living. I don’t know for sure who I am without him next to me, but I know he’ll always be with me and he’ll help me find my way. I recently had to answer a question about my marital status on a form – for the first time since Pat died – and it took me a moment to find the answer because I will always feel married to him, regardless of any legal statement otherwise. I still don’t play my piano, and since playing my guitar and singing for Pat’s enjoyment was so much a part of every day the past two years, I haven’t been able to pick it up again either. In time those things might not be so hard to do without heartbreaking memories, but for now I feel no need to rush myself to do anything other than what makes me happy and peaceful in my new state of life. I don’t expect this to be easy, but I do expect to make it. Our family has a motto, likely adopted from somewhere else but fitting and used often in our conversations: YOLO (you only live once). We remind each other that in the end everyone dies whether they’ve really lived a life or not, so we need to do the things we care about doing, go on adventures, try new things, tell people how important they are to us, and make sure we aren’t just waiting around for the “right time” because now is the right time to live. There are so many people to whom I owe a debt of gratitude for the love and support they have shown to us throughout this experience, people who have been there for me from the beginning and have never stopped helping, offering support, making it possible for me to take proper care of myself, and not only staying in touch with how Pat is doing but checking on me and our children regularly to make sure we have what we need. These are the people who make living a life like this more bearable. They are the people who know the value of time, who in the midst of their own busy and sometimes complicated lives take time to reach out and concern themselves with how ours are going. They know the importance of a phone call, a letter, a card, a visit. They are the people who are here for the long haul. While many of them deserve special mention, naming any of them here would make me risk forgetting someone and I’d never want that. They know who they are, and I will never forget all they have done for me. I recently heard a speaker say that life isn’t about winning the race, it’s about finishing the race and how many people we can help finish the race. I guess sometimes we finish suddenly, on both legs with working parts, and sometimes we finish slowly, losing parts along the way, but still moving towards the finish line, bringing along whatever we have left. Pat finished his race on March 6, 2015, when he passed away peacefully in my arms with our children next to us. We were supposed to have more time. It wasn’t enough. But when I looked around me at couples married a lifetime, struggling to face separation for health reasons or death, watching their pain as I bore mine, I realized that even after fifty or sixty years, they too will wish there had been more time. When two people love each other and choose to spend their lives honouring and cherishing each other because they want to be together forever, no amount of time will ever feel like “enough”. It will always be over too soon. One heart will always be left broken, wishing there was just one more day, one more hour, one more moment to hold onto their “other half” before it’s too late and everything changes into something unimaginable, whatever that might be for them. I just didn’t get enough time. But in the end, I helped Pat finish his race, and after everything we had been through, my final prayer was answered: he passed away peacefully in my arms and he did not die alone without me there to hold him. I got to say goodbye, knowing it was the last time. I don’t remember details about that day, as I do about the day of his accident, but as he was leaving us for this last time, I was given the one thing I didn’t have from that day two years ago: my final embrace, one that lasted for as much time as I needed, one that was burned into my memory and that I will hold onto in my heart forever. I didn’t think my heart could feel any more broken than it already was, but it does. The finality of losing him forever is a new kind of painful and something that will take time to process. Dad spent a lot of years in his early life battling various health issues, the loss of his father at an early age, the loss of a brother. He came through these difficulties and eventually met Mom and together they raised Kate and I. He always worked hard for his family so that we would have what we needed and would have been willing to work two jobs rather than have mom go to work, because he knew it was important for her to be at home with us. He was always more concerned about Mom and us having the things we wanted than about getting things for himself, to the point of wearing shoes with holes in them that none of us noticed until he mentioned water was getting in, and Mom had to make him go and buy himself a new pair of shoes because he didn’t want to spend money on himself. He was always a man of faith, he wasn’t necessarily overly involved in things, but he did what was required of him and knew what was right. 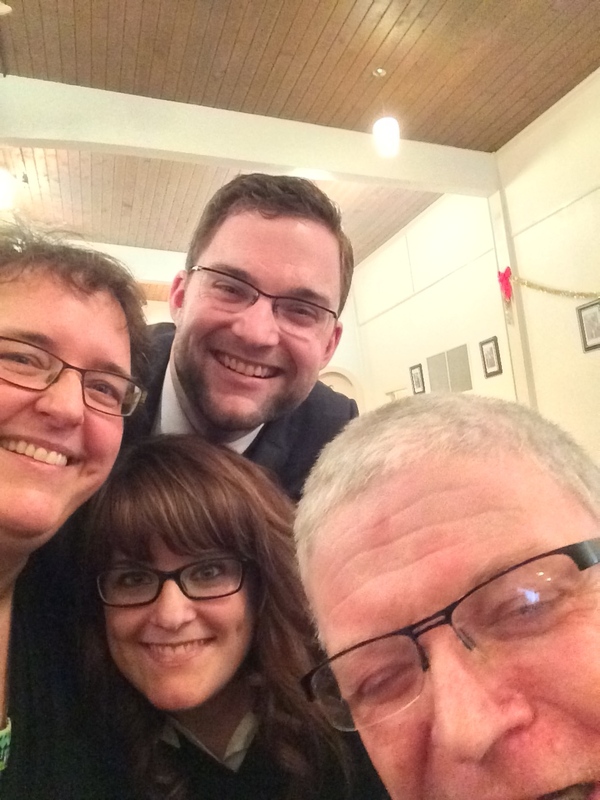 We heard many stories from his days as an altar server growing up in Pugwash, where he was part of a group of servers who had a great relationship with the priest who spent time doing many fun things with them. He was more shy in his later years about becoming an adult server but with lots of encouragement from me we were able to get him involved and he eventually took charge of organizing the group, and doing the job of sacristan. He was involved in the Knights of Columbus and became a 4th degree member in 1985. Dad was often reserved about his feelings, his sense of humour, and showing affection to people outside of our family, but he had a very sensitive heart full of compassion and cared for others, especially those who were struggling. Dad was a man who often cried at the mention of another person’s pain. Many people only ever saw the quiet side of dad. After his accident people saw the beauty of God in him because he often asked people “do you go to church? Are you catholic? Do you believe in God?”, “Are you married? Do you have children? Do you have a family? Are you going to church this Sunday?” “Michael, do you have a girlfriend? This nurse is single. Are you still going to be a priest? Katy, are you going to get married?” Whether or not he understood it himself, it seems that the real question he was asking in all of these was “are you loved?” We don’t ask each other questions like this because we feel like it’s awkward or inappropriate, but he had no inhibitions and he asked the questions because he genuinely cared about people, about their home life, how they were, and whether they had a faith life. Somehow, in his vulnerable condition, he understood at a deeper level how much God loved him, in a way most of us struggle all our lives to discover. The people who have approached our family since he has passed away have talked about how beautiful Dad was, and during the time he was on earth in his wheelchair it was hard for our family because we were struggling with all the stuff that goes along with that, and with all the things that we missed about life with him before the accident, and there he was wanting to sing hymns and say prayers, and just about every day when Mom picked him up to take him to the house for a visit, as soon as he got in the van, he asked if he was going to church. But at the same time, he needed to be lifted in and out of his bed at the hospital, required constant supervision, couldn’t swallow properly, and was unable to remember most of the life he had shared with us, even though he knew that he loved us very much. He talked about how good people were to him, how they took such good care of him, and he never complained. It’s almost like now that he’s passed it frees us to see the beauty of the life that he lived and even though the last two years were full of suffering, when he wasn’t suffering he was smiling, and he was laughing, and he was telling us all that we were the best thing since sliced bread, and he was precious and he loved and appreciated everyone and told them so. We don’t do that as a community or even in our families, because we’re afraid to show our emotions, but he wore his heart on his sleeve. So when people came to visit him, he would be so thankful to them and appreciate their time and their efforts and the people that spent time with him were very affected by his innocence and his purity of heart, and the precious, vulnerable person that they saw. Once the lithium started to work for Pat and he was more alert again, there were new issues that forced me to face the possibility of him not being accepted at a facility in Mayerthorpe, meaning that we wouldn’t even be in the same town, let alone the same house. For a while it looked like he might have to go to a specialized facility in Edmonton, leaving me wondering about how I would stay involved in his life without picking mine up completely and moving away from family and friends to a city where I couldn’t afford to live. It would have been the ultimate blow at the end of all this, and the idea of it crushed me further. For a week or so it looked like things were going to level out for you and you started sleeping well every night. But now you haven’t slept properly for the last four nights and you are much more alert during the day, so unfortunately I’m waiting for something to be wrong again. The alertness is a good thing IF you are also sleeping, but the combination of alertness and not sleeping is a concern. Today you were more “on” than you’ve been in ages, and while I enjoyed my time with you so much today, I was also saddened because I know I will lose you again and I suspect it will be soon. This is the cycle and my hope is exhausted. I now expect things to go wrong and this makes it hard to enjoy the moments that you are very cognitive, because they are generally a lead up to your mania. When I hugged you goodbye tonight, I just wanted to hang onto you the way you were right then so you wouldn’t disappear again. But I can’t win against your bi-polar, which threatens to take away what little I have left of you. Finally we received word that he was able to be accepted to the Mayerthorpe Auxiliary hospital, and while I was very thankful for that option, the move naturally created a turmoil for him and we went through another few weeks of mania – which was a difficult blow for us and for the staff who didn’t know him – and the ongoing uncertainty of whether or not he would be able to stay here at a facility much less equipped to deal with a high needs traumatic brain injury patient. Again I faced the possibility that whatever good had come would be taken away; by then, I just expected it, and I was exhausted by it. Eventually things calmed down for Pat to a somewhat manageable level; I found my new routine and began to settle in at home again. But the day to day struggle of living apart from him and knowing that he missed home and couldn’t remember from one day to the next the reasons he wasn’t able to live with me was a constant source of heartache and sadness. I knew how much I missed him, but seeing his pain was worse than feeling mine. In those fleeting moments when he was coherent enough to ask questions, the answers were very hard for him to hear. Each time he asked it was like a new conversation with the reaction of someone hearing it for the first time. He shed many tears whenever I had to explain that he would be living at the Auxiliary for the rest of his life. The only consolation – if you can call it that – was that the moments were short lived because of his inability to hold his attention long on any one thing, and before long he was distracted by something else, forgetting the discussion until the next time the question came to his mind. I, however, wasn’t easily able to forget the interactions, his tears, or the anguish I felt when I saw him processing the truth over and over again each time it came up. Then another day he would tell me he was doing his best and that hopefully soon the doctor would send him home when he got better, and I would hold my responses until there was actually a question to answer so that he could sometimes just have his thoughts of hope to keep him going. I think sometimes that I have moved past the anger, but then something happens, some moment, and I just want to scream and throw things through a window, as if smashing something to pieces will end this cycle for me. But I know it won’t. Tonight you told me that sometimes you feel like a burden. It is only even fleeting when you have these serious thoughts and I rarely have time to address them before you are onto something completely unrelated, but they pierce my heart nonetheless. When I was leaving for the night, you looked sad and I asked you what was wrong. You replied that you miss me. Usually you are settled in watching your music DVDs when I go home, so I can hold onto my tears until after I leave your room. When you say you miss me and look so disheartened, I just want to hang onto you and at the same time the anger wells up in me instantly because we should not have to part ways every night and live in different places. I read a quote the other day that went like this: “Life isn’t what it is supposed to be. It’s what it is. The way you cope is what makes the difference.” I don’t cope well a lot of the time. There’s just too much pain, and you shouldn’t have to suffer an emotional wound that you cannot understand. At least on a good day I can sort through it myself somehow and know that this is how it has to be in our situation. That is, on a day that I don’t feel the urge to smash something. I never smashed things, but I do remember going to my room one evening because I knew I was going to lose it. I shut the door, sat on the edge of my bed and sobbed. Then I started screaming and did something I’d felt like doing for almost two years: I started kicking the wall and pounding it with my fists while I hollered and let out all the air I had in me until I fell back down on my bed in tears. It didn’t change anything; all I got was very sore hands and I still felt no response from God. I was trapped in an emotional cage and He didn’t even seem to hear me. Over the summer I was able to walk with Pat over to my mom’s house, where we spent afternoons in her garage – my brother made a small cement ramp for Pat’s wheelchair to get up over the ledge from the driveway and to save me extra lifting – and Pat enjoyed helping with wood projects I did to provide something stimulating for him. I was happy to be able to take him out of the facility for a few hours and he liked being outside and watching me work on things. When the weather turned colder, I was able to find a used wheelchair van and get a mechanical lift put on our house so that I could take him home each day for a visit, and spend time with him in our own familiar environment. He loved going to the house and was generally sad to leave, which sparked more questions and conversations about us living apart. It was so nice to be able to have him with me at home even just for a few hours a day, but it reminded him more often that he wasn’t able to stay with me anymore. He would tell me that he really liked it here at home and wished he didn’t have to leave, and then his face would turn sad and he would cry, and my heart would break some more. Everything was a double edged sword. But while so many things turned out differently than we had hoped, and our end result was something we had worked hard to avoid, it is important to me to share that there were still things I was able to enjoy and recognize as much better than they could have been under the circumstances. Once Pat had awakened enough to recognize me and know I was with him, he was always happy to see me come. When he became more able to speak and interact with us, he was able to show us affection and share his feelings of love and appreciation with us, and expressed his joys and heartaches openly and honestly. He was sweet, kind, gentle and affectionate and he wore his heart on his sleeve, having lost his inhibitions after the brain injury. He believed that everyone around him was working hard for him and helping him and he thanked people regularly for the ways in which they helped him with his daily life, his lessons, his exercises. He never complained about anything. He frequently told people he loved them and appreciated them, and he was happy about every little thing that was done for him. He often told me I was doing a good job and thanked me over and over again for taking such good care of him. He was precious and beautiful and he said things in simple and loving ways with the innocence of a child. Looking after him and working to make his life good and happy taught me about what is important and what isn’t; it taught me what my marriage meant to me and how much love I had for him, and that even in his injured and disabled condition, his hug was still my home, because even though the man I married had disappeared in so many ways, he was still there inside, in his heart, where we were always connected. I don’t remember ever not believing in God. I was raised in a Catholic home, we went to church regularly, and this continued into my adulthood, marriage and the parenting of our children. Pat was also Catholic and we were both involved in our parish for many years. I studied and taught adult catechism and helped organize programs designed to help others find God and their place in the Catholic Church. I didn’t understand how people could not believe in God, or how they could go to church for many years of their lives and then just stop going. I confidently answered questions from others with information that I had learned was true, and had no reason to doubt. I knew many things on an intellectual level, about the Church, about faith, about prayer, and about life. What I didn’t know was that despite all I had experienced in my faith for over forty years, my “knowledge” meant nothing once real life handed me something that proved I really had no answers. When Pat had his accident and was in a coma for so long, I held onto the hope and belief that if God had saved his life in a situation where he could easily have died, then the only good reason was that he would wake up and be fine. Nothing else made sense to me. For weeks, I thanked God that Pat was alive and prayed he would wake up and remember our life together. I went to church, I prayed often, I persevered, confident – from everything I “knew” – that it would help and that I was doing what I should do to make sure Pat would be OK. I wasn’t angry; I was scared and lost and devastated by the tragedy, but I didn’t feel anger towards God. I don’t remember when I first recognized the anger; I do remember moments when I needed to scream out loud in the privacy of my car because the anguish and my inability to fix anything were choking me. I knew I was frustrated beyond imagination, because Pat had come out of the coma and was far from fine, but I didn’t recognize it as anger. I was scared to be angry with God. Everything I had learned trained me that was wrong, that somehow it was a terrible offence to question his way of doing things. I think I was angry sooner than I was able to admit and I just suppressed it out of fear for the safety of own soul. When I expressed any sense of doubt, I often heard words from others like “God’s ways are not our ways”, “trust in God and He will take care of you”, “keep praying and don’t lose hope, there is always hope”, etc. and wanted to scream because they just made me feel more alone. I already knew all the lines, the Scripture passages, the cliches that reminded us that suffering was part of our earthly journey and that we don’t always understand it. I just needed people to acknowledge how hard this was even if they couldn’t understand. Trying to be helpful and keep spirits up, they were well intentioned, but with the turmoil in my heart and the loneliness of not being able to share it without correction and reminders, their words just added to the pain. I was having a faith crisis for the first time in my life and it was scaring me. 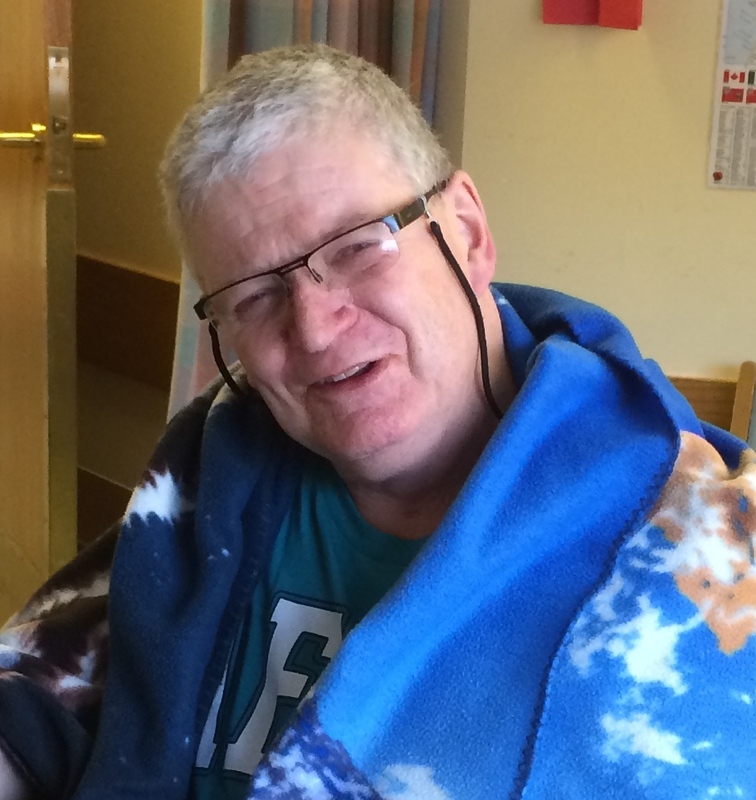 Pat wanted to pray more than ever because, in his vulnerable state – unaware of the extent of his disability – he was thankful to be alive, thankful that God was so good to him, and he knew God’s love for him in a way that I clearly didn’t understand myself. I went through motions with him to make him happy and inside I was falling apart because the last thing I wanted to do was pray to someone who had the power to help us and wasn’t, someone I had been taught to love and honour who seemed to be abandoning me when I most needed help. I still attended Mass on Sundays, because I knew I should go, but it was no longer because I wanted to or felt that it helped me. I was protecting my soul, or so I thought. There was a chaplain at the Halvar Jonson Centre who I believe saved me from completely turning my back on my faith at that time. She wasn’t Catholic – which I note here because all my life it had been my feeling that only Catholic clergy could properly guide and advise me on faith matters because they had been ordained in the Church and knew the teachings, and seeking counsel from anyone outside the Church was a foreign thing to me. It wasn’t something I would even have considered before and I felt a twinge of fear and discomfort at the thought of it. However, there were weekly prayer evenings in the chapel and Pat enjoyed attending, so I took him regularly and I felt a sense of peace in her presence. Eventually, one day, when I realized that I was in spiritual distress, I asked for an appointment to see her. When we met in the chapel that day, I was crying, and I told her I was having a “God crisis”. She took me into her office where we sat down and she asked me to tell her what was going on. So I let it all out: I told her that I just couldn’t help questioning and doubting and being angry, because everything was so hard and I didn’t understand why God wasn’t helping us, why it just felt like he had left us alone and every good thing that came along was taken away so quickly, that it was so hard to hold onto any hope. I was worried I was headed for hell because I couldn’t reconcile how I was feeling with what I thought I understood about faith. And when I was finished sobbing, she gently told me that the whole situation WAS unfair, that what I felt in my situation was normal, that I had every right to be angry, and that God could handle my anger because he was God, that he knew how I felt, and that he would still love me and want me whether I was angry with him or not. It was such a simple thing to say, but no one had responded like that before and I felt certain that she was the pastor I needed right then. She didn’t try to remind me of Bible verses or cheer me up with promises that everything would be OK if I just kept praying and hoping. She didn’t tell me God would fix things and that I just needed to trust him. She didn’t have those answers and she knew it – working in a brain injury and mental health facility had offered her many opportunities to learn that things don’t always work out, and sometimes the results we get are devastating. It was a very enlightening encounter and I was grateful she was there. I began to feel more comfortable in my own thoughts and accept the changes, as experiences continued to turn my familiar world upside down. I won’t say that things just got better after that, because they didn’t, but I felt less guilty for feeling the real things I felt and I began to understand how people could not believe in God, or how they could walk away from a faith they had practiced all their lives. I understood why they didn’t always have clear explanations for those changes and that sometimes a life experience can affect us so deeply that nothing stays the same, even our faith. I was no longer afraid to admit that I had serious questions about what I really believed and what it meant, and what I was going to do with all of that. The day to day challenges of Pat’s ups and downs took their toll on me and I felt like God was dangling carrots just close enough for me to almost reach and then snapping them back again, as one medication after another was tried, appeared to work for a short time, and then failed. I got angrier about what I saw as a cruel game being played with our lives, but I was open about it in prayer and realized that if I was feeling something, I might as well say it out loud because God knew anyway and I was hiding nothing from him by holding back words. I did thank him whenever something good happened, but I learned to stop expecting anything good to last. I had lost my hope, I was losing my faith, and I was losing even more of Pat than I had already lost to his brain injury. I knew my attempts at prayer were forced and that I had little faith left in anything, but I prayed each day that if Pat was supposed to get a miracle, God wouldn’t keep it from him because of my lack of faith. If you feel despair, it means you still believe in something. There was a point when I noticed over the course of a few days that the ultimate doubt was getting stronger and stronger in my mind: did I still believe in God or was this the point at which I was realizing that we really are on our own here? I dismissed the question because I didn’t want to feel guilty or focus on something that could have been a mere temptation. But one night as I was trying to go to sleep, it was going around and around in my head and I couldn’t ignore it anymore, so I turned on the light, sat up, and faced it. I told myself out loud that I had to make a decision one way or the other and then put it to rest. I looked at both options and, as angry and hurt and frustrated as I was, and as much as I felt I had every reason to walk away because I didn’t think I had anything left to lose, I couldn’t imagine a life not believing in God. It just didn’t work for me. So I made the choice to believe. And I went back to bed. From there on, that’s all I had and I knew it, but it was enough. I no longer knew what believing in God was going to mean; I no longer knew for sure who or what He was for me or anyone else, but it was enough to know I believed he was really there, somewhere. I figured that the rest was now up to him because I had tried my best to hold on and every shred of hope had been taken from me despite my efforts and prayers, and I was done. I had nothing left. So I told him that my faith was in his hands. My anger peaked just before Christmas, 2014, when I had been asking myself for a few days just what God could do at this point that would make the situation “better” so I wouldn’t be angry anymore; I knew Pat wasn’t going to have some miracle allowing him to get up and walk and be himself again, and couldn’t think of what would actually satisfy me. Then one day in a conversation, someone asked me out loud the question I’d been unable to answer, and I had to admit to myself that there wasn’t anything that would make it better anymore, that it was what it was, and that I didn’t want to live the rest of my life as an angry, bitter person. I wanted to have a life and to make Pat’s life as good as it could be, and I couldn’t do that until I accepted what was not going to change. Certainly anger is a natural – and I would say necessary – part of the grieving process for most people, depending on their individual circumstances. We are human and we have responses to events that are real and normal, and often suppressing our feelings just hides them away to come out in stronger ways later on. Facing the anger and answering the question helped me move through it to find a peaceful acceptance on the other side. Acceptance in grief is not a place of “happiness”; it is a sad but necessary place to reach. It seems that I found it just in time to learn that Pat’s health issues would take him away from me completely and forever and, in the end, much sooner than we had anticipated. And again, I threw up my hands and thought it typical that there should now be one more thing to learn to deal with, because I had finally made it through the previous trial. There was never any breathing room to regroup; from a human perspective it was, from day one, a series of suddenly changing and ever hurtful steps towards this end, and getting past one hurdle only brought the next one closer. My relationship with God has gone through monumental changes during this past two years. I don’t know where it’s going from here, but I know that it’s now much more real than it ever was before. I’m a real person living in a human world, not a saint with some kind of protection, and I no longer seek to do the “perfect” thing or work so hard to be “good” in hopes that this will save my soul. It didn’t and it won’t. I no longer believe things just because I’ve been taught to believe them, or hold opinions or perspectives that are dictated by whatever I understood my faith to be. None of this should be taken to mean that I’ve turned away from my own religion or that I place blame anywhere, and it’s not to say I don’t care how I live, or about others, because I think I care more now than I did before; I live based on my experience which has changed the way I see the world, the way I see other people or respond to their choices, the way I look at life, and the way I see God. I know things I didn’t know before, and what I thought I knew doesn’t seem terribly important now; it isn’t even something I can clearly explain out loud. I just don’t know if it was supposed to be so hard to have faith – to find Jesus – or if over all these years since He walked on earth, we’ve just made it hard. There are things I can no longer accept without question, and I’m not afraid anymore to have doubts or to look at things differently. I don’t know if anyone really has the answers. I just know that there have been people who saved me over and over again from complete despair and some of them had no connection to my church or any other, so I’m certain that more than just select people are placed in our path to help us get through the trials of this life and find our way to making the decisions we need to make. I’ve experienced tremendous goodness and kindness from people in all walks of life, some who might not even know about or believe in God, but they cared about me and our family. I’ve known dedicated doctors, nurses, therapists, social workers, and care aides who did whatever they could to make tragic lives better, and it just doesn’t matter to me if they ever went to church on Sunday, because I don’t think that is what makes people good. I still struggle every day to find my way back to any sense of hope, trust, or expectation of anything other than a worst case scenario, because my experiences have stored data in my brain that doesn’t allow it to compute things the way it did before. I have no interest in studying the books I used to read, saying specific prayers I used to say, or in worrying about whether or not I say and do the proper things to meet expectations of what my walk from here to eternity “should” look like. Some might read all this and think that I didn’t hang on tightly enough, or that I gave in to temptation and that my loss of faith was my own choice, and I won’t blame them, because had I heard a story like mine before experiencing all of it myself, I might well have had the same reaction. But I’ve given up the idea that we ourselves are always responsible for whatever goes on between us and God. We say that he is the almighty power and authority, not us, so I choose to stop feeling guilty for doubting, questioning, and recognizing that once all the things we’ve been trained to do and believe are stripped away, what we are really left with is the personal question of whether or not we actually believe in God. Answering it then, when all else seems gone, affords us the opportunity to start over again from a fresh perspective. Even though at some point I might again desire more, at this time it’s enough to know that I’ve chosen – in freedom – to believe, and I no longer feel the need to analyze that. 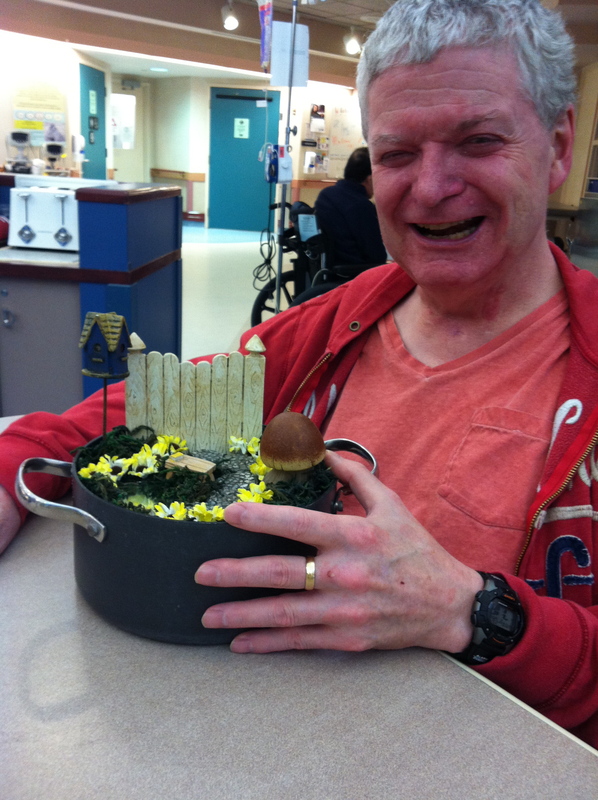 Pat loved the indoor fairy garden we made for him to keep in his room. A staff member had brought her outdoor one in to work just to show him, and he was fascinated by it, so we made him a small one of his own. 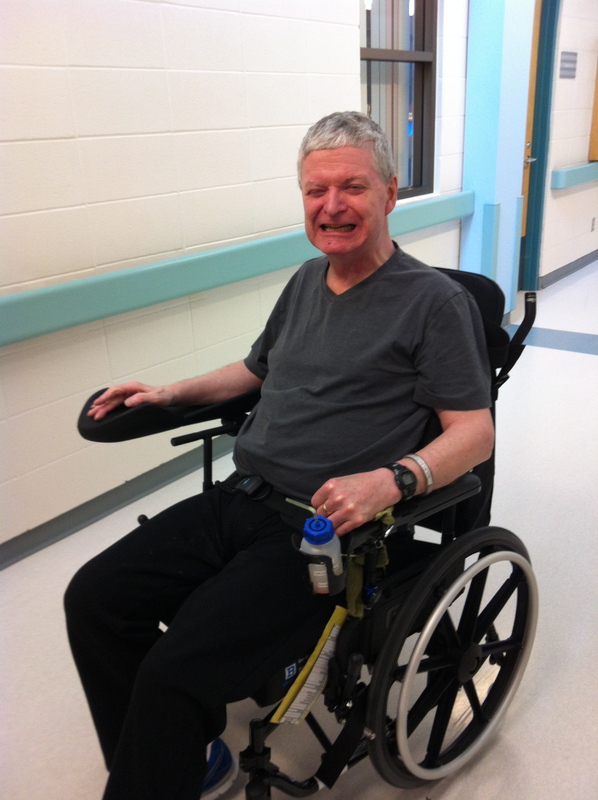 In January of 2014 I recognized that Pat would need to go to long term care, that I would be unable to look after him at home. It was a devastating realization, and one I had to come to on my own, over time and through experience, and it was for me the end of the only thing that had carried me through day by day, the end of the work to get Pat home. That part was over and what remained was to learn to prepare myself to place him in a facility and learn to live with the horrible feeling of separation and the knowledge that no matter how hard I worked, no matter what we tried, the force working against us was stronger and had all the power. In February, I found myself in a dark place emotionally. It was different than just being sad, and I believe that for a time I was suffering from the depression that is part of grieving. I had lost my sense of purpose; Pat was still being stabilized and could hardly interact with me, and I was simply going through motions day by day with no light at the end of the tunnel anymore. I was exhausted, helpless, and I dragged my feet down the long hallway every day wondering what else I would have to face, instead of briskly walking in anticipation of what new thing he would have learned or accomplished as I had done so often before. I couldn’t focus, I could hardly think or make decisions. I cried more and more and began to wonder if I would ever again know what “happy” felt like. Pat’s doctor had told me before that I needed to think more about my own needs because staying around to watch the effects of his manic episode would drag me down and through it all along with him, that there was nothing I could do to change it, and that I needed to be strong enough when it was over to hold my life together. So I started taking more breaks at that time and trying to find ways to take care of myself, knowing that while my presence and involvement had previously been effective with Pat’s physical recovery, there was nothing I could do to fight the chemical imbalance that was now taking away from me what was left of him. But it wasn’t enough. Finally, when I expressed my concerns about the despair I was feeling to the social worker on our unit, she told me I needed to go home for a few days, to spend normal time with Kate and see my mom, to relax and do something fun, and try to regain my strength. I conceded and went home. When I got to town I stopped briefly at my mom’s house where my brother and some cousins were visiting, and received some much needed hugs while I cried until I couldn’t cry anymore. When Kate got off work, I went home with her and crashed. I don’t remember doing anything the next day but sleeping. It felt to me that everything we had gone through was for nothing. 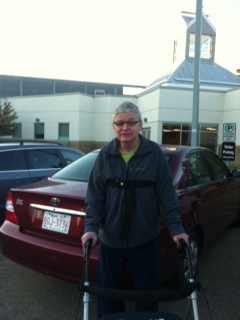 Yes, Pat was in much better physical condition than at the beginning, when long term care was first introduced as a possible end, and certainly that improvement would help him to have a better quality of life even in a facility than if he had remained in a bed with no rehabilitation opportunity. But somehow, after having worked so hard for so long to still end up with living separately forever seemed a cruel twist, when there had been so much progress towards another end. It was a final blow to any shred of faith I had left. I knew God had the power to instantly do something – ANYTHING – that would fix it, and He wasn’t doing it. Pat didn’t deserve any of this; I had worked hard, I had been faithful, and we had come so far only to now experience what just felt like a huge slap in the face in the end. Had I not forced myself to remember that whoever and whatever God was, He wasn’t cruel or unloving, I might have expected He was laughing at me for ever having hoped at all. We’ve all seen and heard by now the advice to be kind, because everyone we meet is fighting a battle we know nothing about. I debated with myself about sharing this section publicly because, while mental health is being discussed more openly now, there is still a stigma surrounding it and so many people don’t understand. But without this huge component, our story is incomplete. After spending almost a year in a brain injury rehab hospital that is attached to a psychiatric facility, I have seen so much pain and suffering that is just part of what I know, the people are part of my memories. Anyone who hasn’t suffered some kind of mental illness or disorder in their life should be grateful they have been spared, and never judgmental of those who have had to face a journey they would never have volunteered to take. I don’t think physical suffering can ever come close to mental anguish; I know for myself it doesn’t. I call this one component of Pat’s many challenges the bi-polar “monster” because when it rears its ugly head, lives are devastated. Bi-polar disorder is a chemical imbalance in the brain, a “physical illness” that affects mental health. It lurks behind the faces of wonderful, loving, sensitive, responsible, intelligent, hard working, and even famous people, always waiting there to throw them into deep waters with no compass. They themselves are not the monsters; the disorder is beyond their control and often beyond anyone else’s control, and all they can hope for is that with the proper medication, it can be kept at bay most of the time so they can live their lives as the special people that they are, enjoying life as everyone else does. Sometimes, if medications work well enough, others never know who they are and even close friends never witness symptoms so are surprised to learn the truth when told. I believe that this part of Pat played a large role in making him more compassionate towards others, more understanding of each person’s journey, setbacks, struggles. He was less judgmental than most people and more ready to excuse, forgive, and support people who needed help. I know he made me a better person. Pat was bi-polar since childhood and in modern terms he was considered bi-polar 1, which means he didn’t manifest depression, just mania. After a long fight to stay above water amidst the stigma and lack of understanding or knowledge about conditions like his in his youth, he was finally successfully diagnosed and treated with lithium years before I met him. In all the time we were together before the accident, I never experienced anything of his condition. He managed it seriously and responsibly, always kept track of his own medication, faithfully got blood work done, and had no issues for over thirty years. When we were first married, I remember reading somewhere that only a small percentage of bi-polar patients are successfully treated with lithium and, of those, most still experience symptoms and have cyclic episodes. Pat was one of the small group of lucky ones who did not. I would later learn that he was unusually lucky all that time and that I could not expect it to ever be like that again after his brain injury. There had been no lithium since the accident, first because of the serious kidney failure in the I.C.U. which followed long term damage that had been slowly creeping up the few years prior, and later because brain injury recovery requires everything in the brain to be firing at full force and any drugs affecting his psyche would have interfered with that. He wasn’t “awake enough” yet after coming out of the coma to assess those things so we were advised that it was best to wait until we had more clarity about what we were dealing with regarding his brain injury and, if necessary down the road, treatment of the bi-polar condition would be considered. I remember the summer of 2012 – just months before the accident – when his lithium level went toxic because he was no longer metabolizing it as quickly, so the dosage was drastically lowered. I was concerned because I didn’t know what to look for in him that might indicate a problem if the levels got too low while the dosage was corrected. His doctor at the time assured me there would be no doubt that something was wrong if it ever happened. Now, with the brain injury, I was wondering how we would ever know, since having a brain injury had already changed everything we knew of his health and behaviour. When the time came, there was indeed no doubt. It happened in September shortly after we got to Ponoka, and it was very obvious, even with his brain injury, that he was going manic. His doctor reacted immediately, using one of the alternates to lithium in order to avoid affecting his kidneys any further; knowing the damage his kidneys had already endured, they were avoiding the lithium. Within days he was settled and for about six weeks, he was stabilized and continuing to make physical and cognitive gains. It looked like the new medication was going to work. Until it didn’t. Just at the time that my dad died and I was leaving for home, they had to begin new medication trials with Pat. I was advised by his doctor and the social worker to follow through on my plans because they would take care of things there, they would be in touch with me, and hopefully in a couple of days we would see improvement. I had no doubt about their quality of care or their diligence. I knew his doctor was in consultation with an experienced psychiatrist in managing Pat’s care and that they were making decisions together and with caution. By the time I returned a few days later, I witnessed what I didn’t yet know was the beginning of the end result that I had tried so hard to fight against, the beginning of what would eventually keep him from ever coming home. The bi-polar challenge would be the final punctuation mark on the story of a battle we could not win. His manic episode was so difficult that he was sedated for weeks on end as one medication after another was tried and ruled out as a failure. His mental health necessarily became the focus over and above his physical therapies, which he was unable to properly participate in during this time. As a result, he lost most of the physical gains he had made and wasn’t remembering things he had been taught. As one medication was introduced and another gradually decreased, it would often appear that there was improvement of some kind – for a day or two, or three, or even a week – just enough to make me hopeful and then there would be more bad news. Each time I would try to find hope and push away the nagging feeling that nothing was going to work. I began to pray that there would be an obvious indication right away if something wasn’t going to work because I could no longer handle having my hopes lifted only to be squashed over and over again. 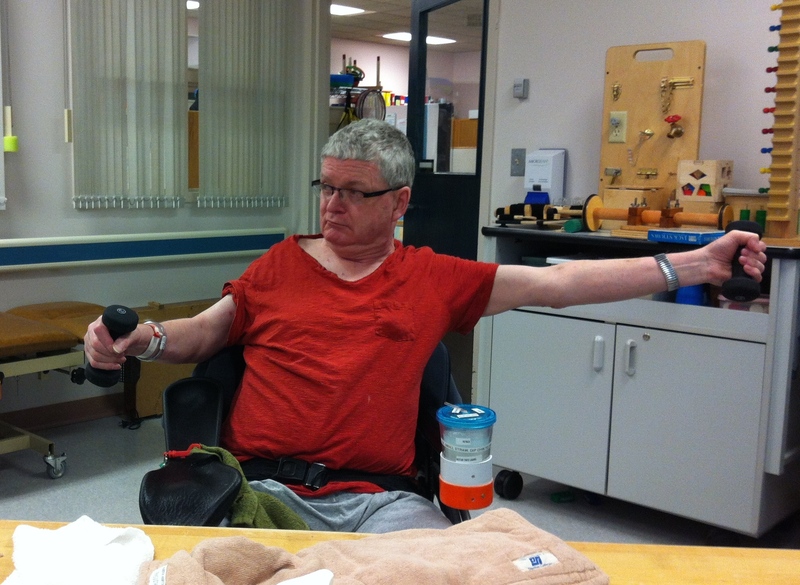 This went on until the end of January of 2014, when his condition was finally “managed” by a drug that basically left him sitting in his wheelchair, drooling and groggy all day, unable to interact effectively with anyone. Although he did still know me and other people around him, he was so out of it that he could barely sit up straight or keep his head up. We had exhausted the list of alternates. After discussing the situation with our children and wanting to try everything we could to help him, I approached his doctor about trying the lithium. It’s one thing to have family conversations when everyone is fine, and talk openly about what to do if this or that were to happen to one of us. It’s far away, it’s probably not going to happen, and it all makes sense from a healthy happy life perspective. It’s quite another to be right there in the moment, actually being the decision maker for a mentally incapacitated loved one, knowing that the choice you make will have negative repercussions down the road, secondary side effects you do not want, and also knowing that what you are choosing is their only good chance for any possible quality of life. The doctor listened and was practical and realistic with me about what I was asking, but he really heard me in my concern that if we didn’t do this, I would never know if it might have worked, if it might have changed something and I didn’t even try. I was willing to sign papers to relieve him of responsibility for my decision. I respected that, as a doctor, he had to be sure he could justify using a drug that would potentially and probably cause Pat secondary harm, but he understood why I wanted it to be introduced there, in the safety of a facility well experienced in brain injury and with access to ongoing psychiatric advice and consultation right next door. It would be safer, and then we would know. And if it didn’t work, then at least we had tried. He knew I understood what I was choosing and he agreed by the beginning of February, when nothing had changed, that it was time. Within only a couple of weeks there was a noticeable change and from there Pat became brighter and more alert, and we knew the lithium was working. His doctor called it Pat’s miracle drug. He was able to resume his therapies and responded well, but was never to regain his previous strength or progress. The lithium managed his condition, but necessarily suppressed certain brain activity that was also necessary for successful rehabilitation and recovery. We would never again see the strength or cognitive awareness he had shown at the beginning of his time in Ponoka. We had lost the fight to get him home. There was some discussion that in retrospect, if there had been a crystal ball, the doctor could have tried the lithium right away and things might have ended differently. But none of us knew whether or not it would still work with his injured brain, and had we gone with it and then had problems after being discharged from there, we would have had to go through all the med trials in a much less secure environment, void of the experience of the brain injury doctor, staff, and psychiatrist, and it would have been another kind of nightmare. We can always look back and wonder “what if….”, but they made the best decisions they could make with what they knew at the time, and I accepted that because I trusted them. I have no regrets. There is no way to know what our end result might have been, or what other difficult decisions could have arisen from other choices made too soon. I had hoped in the early months after Pat’s accident – perhaps naively – that with his injured brain the bi-polar disorder might never come back, and that somehow in the midst of all that he would suffer for the rest of his life from the brain injury alone he might be spared that additional blow. But he wasn’t; I wasn’t. And eventually, watching his mental suffering became as painful for me as watching him deal with his physical limitations, if not moreso. We arrived at the Halvar Jonson Centre in Ponoka on August 21, 2013. I had mixed feelings because I was excited to be there and to have Pat progress even more, but I knew the road ahead was long, that I would have to live away from home for months, until we knew for sure what our end result would be. He was using his legs to move his wheelchair around on his own, using a walker with assistance, standing well enough with the support of a pole to only need minimal help with daily care, developing new memories and showing more clarity with old ones. Settling in with the new staff was a breeze because from day one we felt at home there and I had confidence that they would be taking very good care of Pat, and it was soon clear that they would also take good care of me. 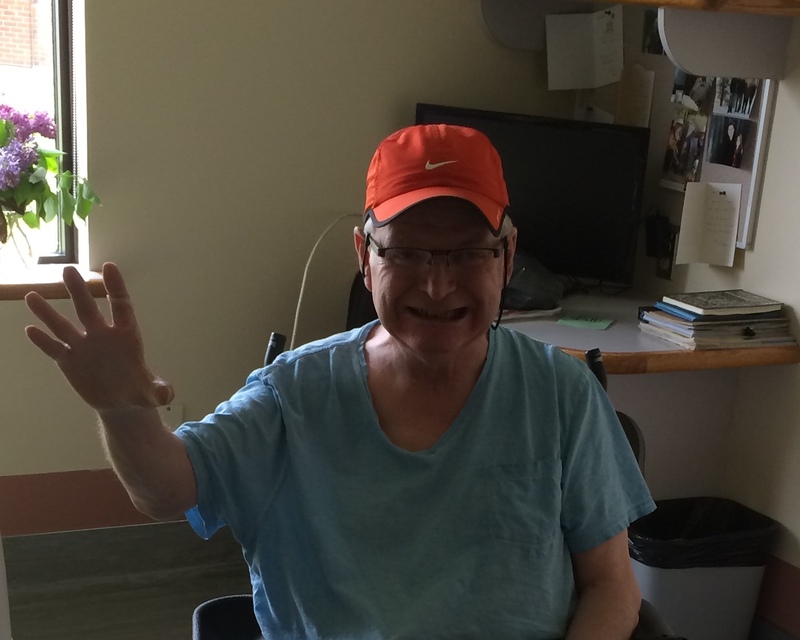 I continued to spend my days with Pat, participating in his therapies and helping to take care of him. He continued to gain strength, find more memories, build new memories, and hang onto the new things he was learning. Within a short time he was learning to shower and dress himself with help, and he was more alert and able to participate in conversations, even showing his sense of humour and making jokes. We were actually able to bring him home to Mayerthorpe for a couple of weekends in October and it went very well. He had learned to go up and down stairs with assistance and was strong enough to walk around the house with someone on each side of him for support. He knew how many times a day he had medication, what the night time routine was to get him ready for bed, and he was speaking clearly and coherently with purpose and interest. He was so happy to be at home. It was encouraging for all of us to see the progress he was making and to have him in our home so we could spend time together as a family in our own familiar surroundings. We laughed and sang and had the opportunity to feel a little bit of what used to be normal. I had somewhat settled into my new rented room in a home with a very nice couple and while being further from home made it more difficult for family and friends to visit regularly, some of them were able to come once in a while and the staff and family members of other patients became my social circle. We were all in similar situations and spending many months together day after day, so there were opportunities to share good days and hard days with each other and know there was a mutual understanding. The staff made the unit warm and comfortable for all of us and were always ready to listen, offer help and support, and lighten our load with smiles, jokes, and encouragement. They had seen a lot in their years of experience so they were great resources and sounding boards. While I missed home and found myself feeling lonely a lot of the time, I knew that Pat was getting better and that his time in Ponoka would be very productive. We were beginning to talk about adjustments that could be made to our home for his eventual discharge, and he was being taught the skills he would need to be able to help himself as much as possible with daily living. And then just as things looked promising, we once again faced an obstacle that in the long run was not to be overcome. I had allowed myself to feel hope once more, and once more it was taken from me. There would be no easy solution and eventually, after all we had been through, we would lose a battle that would take from us most of what was not already gone, a battle we couldn’t win.